Get great-sounding Bluetooth audio from your device to any music system (great for that vintage system stashed in your attic). 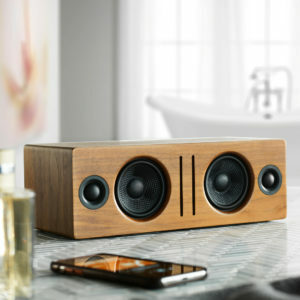 Stream music from your phone, tablet, or computer to any music system or powered speakers. The ultimate Premium Bluetooth music receiver that seamlessly works with all your apps, music, and devices. No matter how you listen, the B1 Bluetooth Music Receiver has you covered. The B1 Bluetooth Music Receiver is a simple way to get great-sounding wireless music from your device to any music system. Setup and pairing is easy and no custom software, driver, or app is needed. The B1 also has special circuitry and a precision-tuned antenna to extend the wireless range to 100+ feet, providing much more versatility and superior sound. YOUR MUSIC WILL SOUND BETTER, GUARANTEED. The audio quality of most Bluetooth products is improving but B1 takes it to a new level by implementing the aptX-HD codec, which offers the highest fidelity Premium Bluetooth audio. Experience stunning audio with the Audioengine B1 Bluetooth Music Receiver including aptX-HD, a 24-bit upsampling DAC, and extended range. 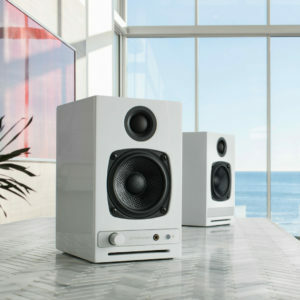 Some of the features we feel make our products better are overall ease of setup, high-quality audio components and design, as well as high interference tolerance - all the good stuff that's important for a wireless product to be of any real use. Audioengine Bluetooth products also features a higher signal-to-noise ratio due to the inclusion of a 24-bit high-performance DAC and much better wireless range than most Bluetooth products - up to 100 FT in most cases. Does the optical output of the B1 utilize the built-in DAC? The B1's optical out is designed to pass the digital signal to another DAC; using the optical output wouldn't utilize the B1's DAC and would simply send the received signal out without padding the bit-depth. The RCA outputs of the B1 would utilize the built-in DAC, so the output would be padded to a 48kHz sample rate. What does the LED indicator light on the B1 mean? If it's on and solid - This means the B1 is powered on, and currently connected to a Bluetooth enabled device. If it's off (and plugged into power) - This means the B1 is powered off (standby) and not connected to a device. The B1 is however still visible to Bluetooth enabled devices in this state. So simply connect to the B1 using your device, and it will automatically wake up. What does it mean if the LED indicator is orange, instead of white? Whenever the pair button's LED turns from white to orange, that means that your source is currently sending it an aptX, or aptX HD signal. What if my source doesn't support aptX®? Can I still use B1 and if so, how will it sound? You can absolutely still use the B1, and it will sound great. aptX® is a high quality Bluetooth audio codec that works really well. With that said, in addition to mandatory support for SBC, Bluetooth also includes optional support for many other codecs, like MPEG-1, MPEG-2, MPEG-4, and AAC, all of which have their own advantages, and some of which sound very close to aptX®. How much latency do Audioengine Bluetooth products have? 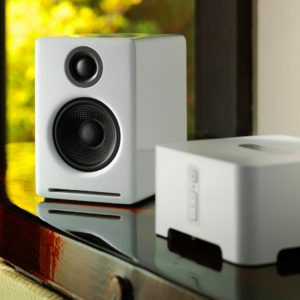 Though overall latency can be affected by some external factors (including things like signal strength, how well the source device's manufacturer has implemented it's Bluetooth, and even simply from being physically further away from the speakers) Audioengine Bluetooth products have very low latency when compared to most Bluetooth receivers, around 30 ms. 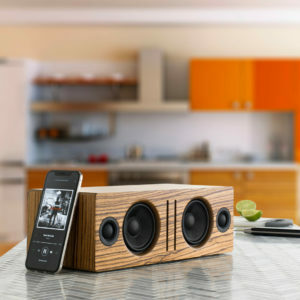 Does B1 work with any stereo, music system, or powered speakers? Yes, any audio product with a standard analog audio input can connect to B1 with the included RCAs. B1 also includes a digital output so you also can connect via optical (TOSLINK). How do I power off my B1? B1 automatically powers-down and mutes the output after about 10 minutes. The BT input, however, is still active so you can just pair to it again without pressing the front panel button. B1 will remain on if a device is paired with it and turned on though. OK, so If I can use the B1 with TIDAL, how come you're not listed on TIDALs website? Will the B1’s range work between more than one room? The overall range you can expect will vary depending on the device you use with the B1. We tested using mostly a variety of smartphones though, and found 100 FT to be a realistic expectation, and that's through one wall. Will B1 interfere with my network and slow it down? The B1 uses Bluetooth, which operates on the same 2.4GHz band as most Wi-Fi Routers. There's always a possibility for interference with wireless technology on the same frequency, but in our testing this was very uncommon. 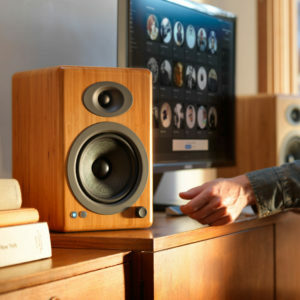 Can I use my computer speakers and the B1 at the same time? If B1 is connected, do I need to do anything else to play music from my computer using iTunes or Amarra? Once your B1 is paired and connected then any app (iTunes, etc.) or online players (such as Youtube) will automatically play your music through Bluetooth. I have multiple B1s, can I change the name of the devices in my Bluetooth settings? We've found that Android will allow you to assign nicknames of specific bluetooth devices; this means you can name it whatever you want (Living Room, B1 (2), etc.). If you are using an Apple computer with OS X, then you can rename bluetooth devices in the bluetooth settings; however, iOS devices (iPhone and iPad) do not support this feature. Does B1 transmit a stereo signal? Yes, the B1 transmits 16-bit stereo audio. Do I need to install any special drivers for the B1? No extra software or drivers are needed. The B1 is compatible with any device that supports Bluetooth, and the A2DP profile for streaming stereo audio. This includes most all Smartphones, Tablets, and Laptop Computers. How can I tell if my device supports aptX®? Can I use the B1 with my original A5s? Yes, you can still use the B1 with the original A5 model! With this kind of setup, you'd just need to use either an RCA to mini-stereo adapter (like the one that was included with your A5s) or an RCA to mini-stereo cable. You would just connect the RCA end into the RCA outputs of the B1 and the connect the mini-stereo side to either the top or back mini-stereo inputs of the A5s. I'm having trouble connecting my Windows machine to my B1. The B1 uses the Bluetooth drivers located on your computer, so you may need to ensure you're using the most up to date drivers for your computer's Bluetooth. We'd also recommend going to the manufacturer of your computers website, and see if they have Bluetooth drivers there. Will my music have a delay if I’m watching a movie or music video? B1 has a delay of about 30ms (milliseconds) so you can watch videos from Youtube, for example, and stream out the audio through B1 to your stereo system without any noticeable lag between the video and audio. Is the B1 compatible with TIDAL music streaming service? The short answer is yes! You can use TIDAL on any compatible source device (PC, Mac, iPhone Android, etc.). The B1 is compatible with most all of these devices as well since they almost universally also include Bluetooth.